Organizations increasingly recognize the value that predictive analytics and big data offer to their business. The complexity of development, integration, and deployment of predictive solutions, however, is often considered cost-prohibitive for many projects. In light of mature open source solutions, open standards, and SOA principles we propose an agile model development life cycle that quickly leverages predictive analytics in operational environments. Starting with data analysis and model development, you can effectively use the Predictive Model Markup Language (PMML) standard, to move complex decision models from the scientist's desktop into a scalable production environment hosted in the cloud (Amazon EC2 and IBM SmartCloud Enterprise). 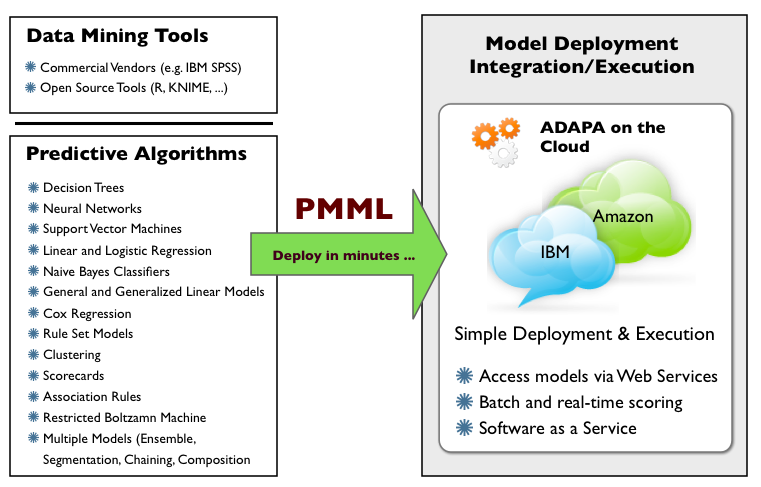 PMML is an XML-based language used to define predictive models. It was specified by the Data Mining Group, an independent group of leading technology companies including Zementis. By providing a uniform standard to represent such models, PMML allows for the exchange of predictive solutions between different applications and various vendors. Open source PMML-compliant statistical tools such as R, KNIME, and RapidMiner can be used to develop data mining models based on historical data. Once models are exported into a PMML file, they can then be imported into an operational decision platform and be ready for production use in a matter of minutes. Both Amazon and IBM offer a reliable and on-demand cloud computing infrastructure on which we offer the ADAPA® Predictive Decisioning Engine based on the Software as a Service (SaaS) paradigm. 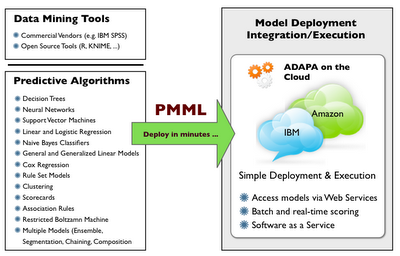 ADAPA imports models expressed in PMML and executes these in batch mode, or real-time via web-services. Our service is implemented as a private, dedicated instance of ADAPA. Each client has access to his/her own ADAPA Engine instance via HTTP/HTTPS. In this way, models and data for one client never share the same engine with other clients. Each instance executes a single version of the ADAPA engine. The engine itself is accessible through the ADAPA Web Console which allows for the easy managing of predictive models and data files. The instance owner can use the console to upload new models as well as score or classify records on data files in batch mode. Real-time execution of predictive models is achieved through the use of web-services. The ADAPA Console offers a very intuitive interface which is divided into two main sections: model and data management. These allow for existing models to be used for generating decisions on different data sets. Also, new models can be easily uploaded and existing models can be removed in a matter of seconds. Using a SaaS solution to break down traditional barriers that currently slow the adoption of predictive analytics, our strategy translates predictive solutions into operational assets with minimal deployment costs and leverages the inherent scalability of utility computing. Cost-effective and reliable service based on two outstanding cloud computing infrastructures: Amazon and IBM. On-demand computing. Choice of instance type and launch of multiple instances. Superior time-to-market by providing rapid deployment of predictive solutions and an agile enterprise decision management environment.